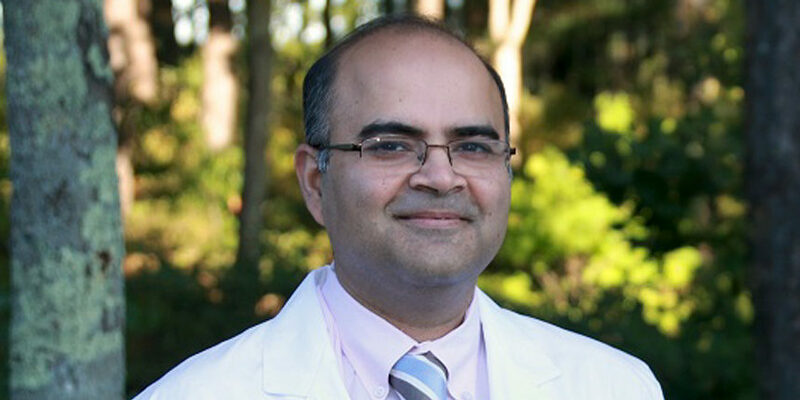 Dr. Ashwini Sahni, a cardiologist with Southcoast Health, wants to change the conversation around cardiac care. Instead of just focusing on curing sickness, he wants more discussion of prevention and wellness — starting when people are young. Dr. Sahni worries about statistics that suggest that 58 percent of American children are obese by the time they reach age 18. Obesity is associated with high blood pressure and cholesterol, and he fears that he soon will be treating hypertension patients in their 20s. He is also concerned that one in six Americans are taking psychiatric drugs, mainly antidepressants, and that increasing numbers of people are becoming chemically dependent. Studies show a link between depression and heart attacks, and sustained stress and anxiety are related to a host of unhealthy behaviors, such as overeating, smoking, drinking alcohol and physical inactivity. All are associated with cardiovascular problems. Dr. Sahni started practicing what he preaches four years ago. He noticed his cholesterol levels inching up and wanted to avoid medication. He became a vegetarian and started taking an hour every morning to exercise, meditate and listen to music. While Dr. Sahni succeeded in lowering his LDL cholesterol — considered the “bad” cholesterol compared to HDL — he doesn’t urge all patients to banish meat from the menu. But he does push them toward a Mediterranean diet, which emphasizes fish, legumes, fruits and vegetables. He also urges them to start exercising, and leads a health walk every month starting at the Wareham YMCA. The program also includes yoga instruction, meditation and lessons in vegan cooking. He says the program promotes a lifestyle that can improve all aspects of health. In addition, eating well, managing stress and exercising create a virtuous cycle that promotes emotional well being. “You are less likely to become chemically dependent if you feel good within yourself,” he says. Dr. Sahni’s dream is to expand the community wellness program, which he offers at no charge. He has begun writing children’s books with the dual aims of raising money and seeding positive ideas among children ages 3 to 9. His first book, The Dream Team, shows the benefits of working together. It features rhymes by Sahni and illustration by Ayla Canaran, a teen who also demonstrates vegan cooking in the wellness program. They have finished a second book, about unlocking the giant in every child, and plan a series that will also include stories on staying focused in the digital age and the perils of judging other people.